Looks like "Govt-is-dumb-But-I-Am-Smart-KnowItAll" are appearing in full force what with even village idiots running a "blog" now. Even when your beloved US gets hit with lot of rain or storm it is the same story there. When Florida gets hit every year same story there. Thousands of houses are damaged, roads are submerged, electricity is cut. But no, we are desis and we need to crib even when highest rain fall of the century hits the city. The claim re: south Bombay was made by a newspaper - Midday. I did link it but admit I may have been mistaken. It wasn't known to me at the time that the southern part of Bombay recd only abt 75 cms of rain while the suburbs recd several times that! Have amended what I wrote! Yes, natural disasters happen eveywhere but a lot of the problems on Tue occured because of lack of information. Every year Bombay has a couple of bad raindays and you just think "I'll brave it out" - no one knew it could possibly get life-threatening. Compared to the monsoon situation the ONGC fire was handled far better. The Chairman and petroleum minister were on TV within 3-4 hours of the incident addressing a press conference. If the same strategy had occured to the CM on Tue around 5 or 6 pm there would have been far fewer stranded commuters. Yes, natural disasters happen eveywhere but a lot of the problems on Tue occured because of lack of information. This may well be correct. If you look at Mumbai Disaster Management Plan (Sec. 4.2 Communication and Public Information Systems), there is a wish list of items that the Govt. would like to have to do a better job of information dissemination. I would point out, in the light of multiple systems failures experienced on Tuesday and Wednesday, that such a simple minded approach may fail again. Even after power came back, cable networks in many parts of city were still unoperational. Many people have mentioned that they had to depend on radio to get any information. The current DMP does not mention anything about FM radio stations that turned out to be very helpful in this situation. 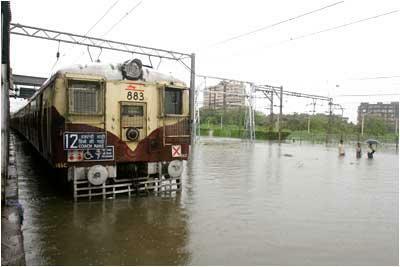 Again, this was no simple disaster as Bombay got it's July average for rain equivalent in one day!